Metropolitan style gracefully employs classic motifs to create a traditional, elegant design that is at the same time luminous and vibrant. The tiny and subtle pinstripe background, the engraved serif font, and strong wide border bring a structure and strength to a style that is at the same time graceful and elegant. The text is all balanced in the center of the style against a white field, and it is bordered at the top and the bottom by a strong wide border and a wide band of its signature pinstriped pattern. 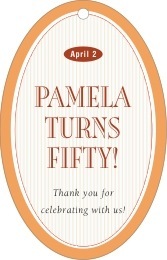 Customize your Metropolitan milestone birthday tags today to celebrate the occasion! Metropolitan milestone birthday tags are printed on extra-thick cover weight white paper and come in a variety of shapes and sizes (including square, circle, a scallop-edged circle, ovals, and other more intricate shapes). Milestone birthday tags come pre-punched with a small round hole to thread your choice of tying material. They are punched out individually and packaged as a set in small bags. Select a shape and color from above to start personalizing your Metropolitan milestone birthday tags today!